Successfully Added E-CEROS 1080p Car DVR Kit - Android OS, 6.86-Inch, GPS, 1080p Front Camera, Rear-View Parking Camera, Parking Monitor, 3G to your Shopping Cart. Significantly increase your safety on the road with this two-in-one car DVR and a rearview parking camera set from E-CEROS. 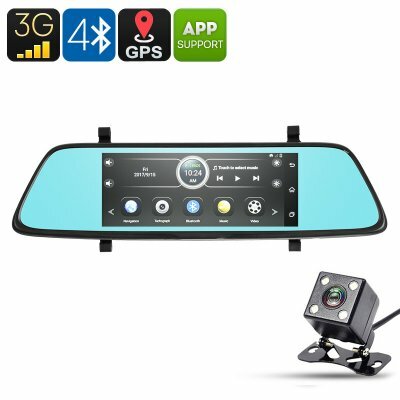 Coming with two cameras, this car DVR kit provides you with a clear overview of all what’s happening around your vehicle. The front DVR features a 5MP 1/4-Inch CMOS sensor and treats you to crisp and detailed 1080p footage. With a viewing angle of 160-degrees, it captures all that lies ahead. The rearview parking camera shows you all what’s going on behind your car in a 120-degree angle. This allows you to easily park your car in reverse without needing to worry about bumping into something. On its 6.86-Inch display, you’ll be treated to clear real-time footage at any given moment. What sets this car DVR apart from regular dash cams is the fact that it features an Android operating system and has GPS so you will never get lost again and the helpful map overlay is mounted on your rearview mirror for easy viewing. Whatsmore you’ll be able to access Google Play store and enjoy media in your car straight from its compact display. This provides you with perfect means to entertain kids and other passengers during upcoming road trips and holidays. Your car DVR system furthermore supports WiFi and 3G connectivity, meaning that it lets you browse the web no matter where you’re at. With its Quad-Core processor and 1GB RAM, it handles all basic applications out there. With its Bluetooth support and built-in mic and speakers, it lets you engage in hands-free phone calls at any given moment. It additionally allows you to access your car DVR camera remotely through the dedicated mobile application. This allows you to keep on eye on your car even when you’re not around.